in 360i News, Startup News with tags SMW13, SMWTASC, socialmediaweek Both comments and trackbacks are closed. 360i’s second Social Media Week event, held last Thursday, assembled the Technology, Advertising and Startup Council (TASC) to address startups’ most pressing questions when it comes to working with brands. Established last September, TASC is a multi-agency council that fosters collaboration between startups and Madison Avenue, exploring best practices for startups partnering with brands and creating an open dialogue among key stakeholders from both sides. 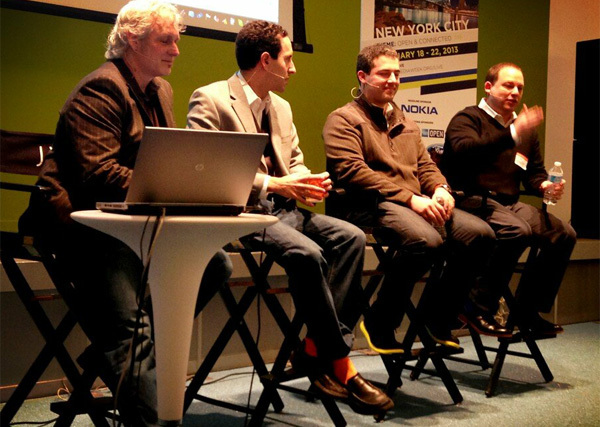 Our own David Berkowitz, VP of Emerging Media at 360i, is among the founding members. During the session, the Council answered a flurry of questions from startups eager to learn more about securing brand partnerships and working alongside marketers. Beyond answering live audience questions, the panel also addressed queries submitted via Google, Twitter and LiveStream during the 90-minute session. What is the best way for a startup to get an agency exec’s attention? Members of the Council agreed that having a personal connection with someone in the company and building upon that relationship is the best place to start. When considering who to pitch within a brand, TASC members stressed the importance of finding the most relevant person. This individual may or may not be a member of the C-Suite. For example, consider the person who is working until 12 a.m. to solve a client problem for which the startup’s technology can directly benefit. When pitching, be sure to not downplay the value of the technology. Show examples and personalize them so they align with the vertical or objective of the marketer. Although new technology can be a big investment, it can still certainly be worth it. New ideas that require additional legwork are often the ones that are most successful. What are the top areas brands are looking to invest in during the next 12 months? Determining where to invest in the next 12 months—let alone in the next two weeks—is a hard thing to do given the pace of change in digital. As one of the TASC founders put it, this type of long term planning is a “moving target” for most brands. In the larger picture though, mobile is emerging as a lead actor with more brands coming to realize the importance of a strong mobile program. Shopper marketing, including retail analytics for both in-store and online (and mobile!) purchases, as well as automotive and TV opportunities are also popular considerations at this time. Most brands want to innovate but then shy away from the inherent risk that comes with new technology. How can startups overcome this obstacle? Staying abreast of innovation takes an entire organization. At the agency level, on-going education is critical. Here at 360i, we create regular opportunities for employees to explore new startups and technologies with events like bi-weekly “Bagels and Beer” sessions with David Berkowitz and through our 360iU education and training center. But not all brands are able to stay up-to-date on the latest and greatest technologies out there, and they are increasingly turning to agencies and startups to assist them in navigating the tech terrain. This presents a great opportunity for startups—if they can pitch their product/services smartly. TASC members suggest looking at the big picture and steering away from merely pitching the benefits of their offering. Find a way that your technology can help solve a problem for the brand by researching that brand’s primary goals and the specific KPIs for which you’ll be measured. And then deliver. Deliver on something that is relevant to the brand and its current strategy for solving a bigger-picture problem. In the end, innovation for the sake of innovation won’t cut it for brands – your technology must also be a good fit for their goals and audience. By establishing relationships with the most relevant decision makers and tailoring your pitch to brands’ core business needs, startups can establish value and prove to marketers that their product/service is worth the time and investment.